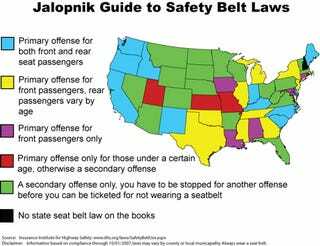 With the exception of New Hampshire, whose state motto is Live Free or Die, all states have some sort of mandatory safety belt law. In some circumstances, the amount of damages one can collect in a claim can be reduced if the injuries could have been prevented by wearing a belt. There are currently 26 states plus the District of Columbia that have primary seat belt laws, meaning you can get popped merely for not having a seat belt on, despite committing no other infraction. Within these states there are three major varieties. The most stringent laws are those requiring all passengers of a certain age to wear a seat belt in all seats within the vehicle. These are: Alaska, California, DC, Delaware, Idaho, Indiana, Kentucky, Maine, New Mexico, North Carolina (secondary for rear seat occupants), Oregon, South Carolina and Washington State. There are ten states that have primary laws for front seat passengers/driver, with rear seat offenses for passengers of a certain age: Georgia, Hawaii, Michigan, Mississippi, New Jersey, New York, Oklahoma, Tennessee, Texas and Illinois (where it also depends on the age of the driver). Your rear seat passengers can feel free to legally take a nap or chillax in the back seat with no kind of seat belt in Alabama, Connecticut, Maryland, Iowa and Louisiana. It's a primary offense in Kansas, Missouri, Rhode Island and Utah if your unbelted passengers are under a certain age, but a secondary offense otherwise. You'll have to commit some other traffic infraction to get ticketed for not having a seat belt in the following 19 states: Arizona, Arkansas, Colorado, Montana, Nevada, Florida, Nebraska, Idaho, North Dakota, Massachusetts, Minnesota, Ohio, Pennsylvania, South Dakota, Virginia, Vermont, West Virginia, Wyoming and Wisconsin. (So make sure all your taillights work.) As a passenger in Ohio or Wyoming, both the driver and passenger can be ticketed if someone isn't wearing a seat belt. The age and seating requirements for a law, as well as amount of the fine vary by state, so check out this chart to see the details within your community. Texas, a state known for Draconian laws, is equally harsh when it comes to belting. While most states issue penalties of between $10 and $50 per incident or passenger, The Lone Star state exacts the highest single-person failure-to-buckle fine in the country — up to $200. A seat belt can be a livesaver, but a five-point racing harness looks that much cooler and can keep you nailed to your seat in the twisties. Zonda v. GT-R At Nurburgring, Who Will Win?